Travel-Tot: Childproofing Away from Home! One of the most unnerving things about travelling with young children is not being able to predict how they will behave in unfamiliar surroundings. Young children are naturally inquisitive, and often quite fearless – a dangerous combination for exploring new spaces without adequate supervision. Take for example the recent near-tragedy of 16-month old Jah-Nea Myles; while vacationing with her mother in Orlando, FL, she was left in an adjoining hotel room under the care of a close friend. In the few moments it took that friend to quickly use the restroom, Jah-Nea managed to escape outside through the unlocked balcony door and wriggle through the balcony rail where she eventually lost her grip and fell four stories. The story has a happy ending; another hotel guest noticed the toddler dangling precariously and ran to the spot beneath the balcony, managing to catch the child and soften what would surely have been a fatal landing. But what if that guest hadn’t been there? Those few, brief, unsupervised moments could have cost Jah-Nea her life. Stories like Jah-Nea’s were what inspired the founders of Travel-Tot, LLC to create their innovative, temporary, Travel Child-Proofing Kit. The kit contains an assortment of childproofing devices all of which go on strong but can be removed cleanly once it is time to check-out. The kit components that require installation are all secured with strong, temporary, 3M adhesive strips so that they can be removed (without damage to surfaces) and re-used. 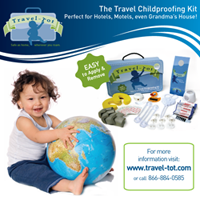 The extra layer of protection the Travel Child-Proofing Kit offers can be the difference between life and serious injury or death; and can also afford parents some sorely-needed peace-of-mind. While no childproofing measure is a substitute for adequate parental supervision, having your hotel room child-proofed can help relieve the constant stress associated with keeping your child(ren) away from every potential hazard. Below is a quick checklist of steps you can take to help add a layer of protection between your child(ren) and the hazards that await them in hotel rooms, motel rooms, or even grandma’s house. Make sure that if you are using a hotel-provided crib that it is up to standards with the Consumer Product Safety Commission: slats should not be more than 2 3/8 inches apart and all sides should be fixed (no drop sides). Whether using a hotel-provided crib or a port-a-crib from home, remove pillows, toys, or blankets that may cause suffocation or strangulation. Unplug electrical appliances (i.e. hairdryer, razor, etc.) and store them in a locked drawer or cabinet. Ensure that the bathtub floor has a non-slip surface or that there are non-slip mats or decals available. Keep hazardous products out of the reach of children (i.e. mouthwash, shampoo, cosmetics, medications, etc.). Bring and install some basic childproofing gear (such as the items found in the Travel-Tot Travel Childproofing Kit). Keep low cabinet doors shut with straps. Secure corner guards onto furniture. Place pinch guards on interior swinging doors. Install guards on interior sliding doors. Insert outlet covers into unused outlets. If your little traveler is curious about the toilet, be sure to place a doorknob protector on the handle or install a locking strap if the door has a lever handle. Keep furniture away from doors and windows to prevent access to locks and accidental falls. Finally, be sure to arrange the furniture in a way that allows for some play space; a room full of “no-nos” will result in bored and irritated toddlers, which will lead to stressed and anxious parents! Memorial Day Salute to Military Families! Sanity and the Single Parent! Mother's Day "Peace of Mind" Giveaway!